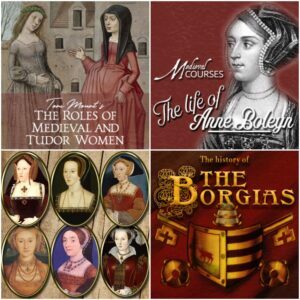 25% off The Life of Anne Boleyn course, The Six Wives of Henry VIII course, and more! Just a quick post to let you know that MedievalCourses.com has a sale at the moment. You can use coupon code THANKS2018 to save 25% on all of their online history courses between now and the end of Sunday 25th November 2018. Courses include my course “The Life of Anne Boleyn” and Gareth Russell’s “The Six Wives of Henry VIII”, and there are also courses on the Reformation, medieval and Tudor women, the Borgias, the Medicis… lots! You can see the full course list at https://medievalcourses.com/overview/. You can use the coupon for as many courses as you like and these courses are completely online and don’t have a set start or finish date, so you can complete them in your own time and save now, but start when it suits you.